We like to spread out the joy at this time of year. We celebrated the start of the Christmas season at our November meeting which was held at All Saints Church Hall. We shared a tasty finger food buffet and lots of chat. Winners from our Exhibition, Dianne Clarke (People’s Choice Award) and Pam Fletcher (My Geelong Challenge winner) were presented with their awards. Our December meeting is to be held on Monday 14th December where our Melbourne President will conduct our election for committee for next year at our Annual General Meeting. Please come and join us – we have some new members nominated for committee and would like a good turn out of members to welcome them. The meeting starts at 11am back at our usual place – St Davids Church Hall, Aphrasia Street Newtown. 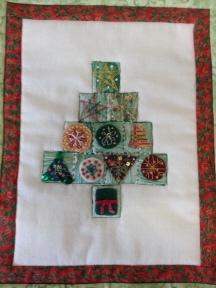 Don’t forget our Mystery Christmas Workshop at 10am on 3rd December. Bring a plate to share for lunch but contact us so we can organise supplies for you to work with. This entry was posted in Meetings and tagged AGM, Challenges, Christmas, Meetings by EGV Geelong Admin. Bookmark the permalink.